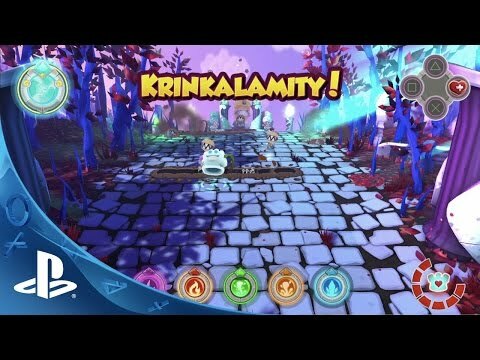 Krinkle Krusher is an action castle defense where you cast elemental spells to defend your kingdom from the twisted and hungry creatures called Krinkles. After several generations of peace, they happen to come back exactly when the Ancient Tree bears its first fruits in centuries… and of course a cake was made from it. Freeze, burn, zap them all! Cast spells to defend your castle! Use the power of fire wall, ice crown, mud, energy mine, thunder and tornado. Hit the various Krinkles weaknesses and combine your powers to keep them away. Upgrade your spells and castle to face the bigger Krinkle hordes and the bosses! It's a special time in the kingdom, the great tree, where the castle was built around, had its first fruits! No one has ever imagined until now that it was possible, since it has never happened in centuries! Due the great amount of fruits, the kingdom decided to have a huge festival to commemorate the event and used the fruits to make a huge and delicious cake. But it seems that something more ancient has also been awaken by this delicious fruit. Inside the magic forest, far away from the kingdom, the Krinkle King woke up desiring for that delicious fruit! Using his magic power he started to create his own krinkle army and ordered them to go to the castle and steal whatever had that delicious smell for him. Know each one the funny and dangerous Krinkles, listen to the Glove witty commentaries and know the fate of the Kingdom and the Krinkles. AIM AND PLACE POWERFUL SPELLS! Have precise control and place your spells where you want. Get powerful items and combine the speed of your moves with the right element combination strategy. Try to keep up the pacing and make great combos! There are a lot of different Krinkle races to be dealt with, each one with different abilities and weaknesses. And when you think you have won, prepare to face the bosses: the Mighty Krinkle Generals and the Krinkle King! Learn new spells as you win the battles and upgrade their power, range and special attributes! Defend your castles at day and night; beware of the fog and climate conditions that may change your gameplay strategy! The game features 60 levels split in 3 different areas of the Kingdom that will need 4 or more hours to be completed and mastered!